Emergency services responded to a collision involving a motorcycle on Paynters Road in Hamilton Parish at approximately 1.45am this morning [Dec 21]. Bermuda Fire and Rescue Service personnel and Police attended the scene and tended to the injured rider until an attending ambulance transported the rider to King Edward Memorial Hospital for treatment. Police diverted traffic away from the area which was located near Harrington Sound Road until a traffic collision investigator and the forensic unit processed the scene. Regular traffic flow resumed after 3am. Details are limited at this time, however we will update as able. Update 8.04am: The police said the rider — a 23 year old man — is listed in critical condition in the Intensive Care Unit. The full police statement is below. 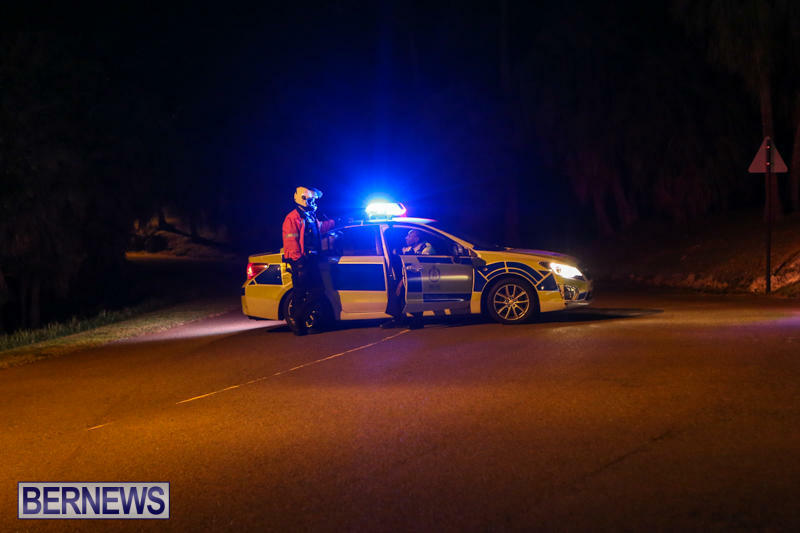 Police and first responders attended report of a serious road traffic collision on Paynter’s Road near the junction with Harrington Sound Road in Hamilton Parish at 1:33am [Sunday]. It appears that a rider of a cycle was travelling east on Paynter’s Road when he lost control of the cycle and struck a tree on the opposite side of the road. The 23 year old man was rushed to KEMH via ambulance where at this juncture he is listed in critical condition in the Intensive Care Unit. Police are appealing to anyone who may have seen this collision to contact police on 295-0011. Update 2.10pm: The police have now confirmed the death of 23 year old Shawn Williams of Paget, which marks the 14th road traffic fatality for 2014. The full police statement is below. The Bermuda Police Service can now confirm the death of 23 year old Shawn Williams of Paget and extends condolences to his family and friends. Mr. Williams was seriously injured in a road traffic collision on Paynter’s Road near the junction with Harrington Sound Road in Hamilton Parish at 1:33am on Sunday. It appears that he was riding his motorcycle east along Paynter’s Road when he lost control of his cycle and hit a tree. Following the collision Shawn was admitted into the hospital’s Intensive Care Unit, where he remained until his passing a few hours later. A Family Liaison Officer has been assigned to Mr. Williams’s family to assist them at this difficult time and a full investigation into this fatal collision is underway. The Bermuda Police Service continues to appeal for any witnesses to this fatal collision especially persons that may have information regarding the whereabouts of Mr. Williams the hours prior to 1:33am on Sunday December 21st , to contact the Roads Policing Unit on the main police telephone number 295-0011. This marks the 14th road traffic fatality for 2014. Another senseless death and a life gone too soon. On behalf of the people of Bermuda, our thoughts and prayers are with the family. Sending condolences to family and friends!!!! Hard to believe. Just the other day you were knocking on my door and now you are gone. RIP Shawn. Heartfelt condolences to the family and all his friends. Condolences to the family. So sad. Dislike button is an error. There was something on my touch screen and when trying to wipe it the dislike button got tapped twice. R.I.P Shawn, condolences to the family. Agree with Bermy Boy. This is really sad. my prayer’s go out to his family,may God comfort you all @ this time & forever. a mother holds her children’s hand for a while but their heart’s forever, it never fail’s a family alway’s suffer’s a lost one to a road fatality, had my turn & still hurting. hold your heads up. my heart is with you all. GONE TO SOON. S.I.P. SHAWN. YOU ARE & WILL ALWAYS BE IN MY HEART.GOD BLESS, SO SAD. You will truly be missed cousin. Rest in paradise. Prayers sent to my whole family for this tragic accident. Love and miss you all. Gosh… some people can be so heartless! If you don’t believe in God or prayers, doesn’t mean you have to dislike a post from someone that does believe! Just ignore it and read the next post! Wonder how many dislikes this post will get? SMDH!